I was a cross country runner in high school, but my running since then, in the last 7 years, has been very sporadic if at all. I'm a healthy, fairly athletic 25 year old and I want to get into a good running program again and get into top shape. Do I start from scratch with beginner workouts or can I take a step up from them into more intermediate plans since I've had previous running experience? I can relate to your story. I used to be a very fanatical soccer player until I was about 16-17. Then uni started, I stopped playing soccer and stopped a lot of fitness activities. I would still occassionally get back into sports, played a bit of squash and racquetball etc., but nothing structural. When you have had a long time off running, you run the risk of overestimating your abilities. I am not saying that you need to start at the complete beginning, but I would hate to see you start running, only to give it up after 3-4 weeks due to running injuries. One important thing to consider is your goals. What does top shape mean for you? Being able to run a marathon or run your fastest 5k? This will determine to a certain extent the type of running training you need to do. Marathon training is more geared towards longer, slower running. 5k training is much more focused on short intervals and speed work. Whatever you do, it is good to start re-building your running base by working towards being able to run 60 minutes non-stop. 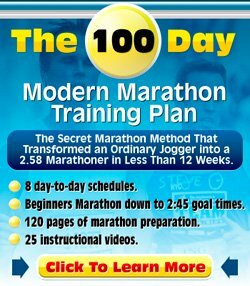 If you are currently able to run 30 minutes non-stop you could consider having a look at my 10K Running Program. If you are not quite at that level, then build up your running towards that by using the build-up of my Beginners Running Program 3. You don't have to follow that one to the letter or start at the beginning, but use the idea of a slow but steady build-up and consider walking breaks in the beginning. They are not as silly as you may think. If you are currently able to run 10 minutes non-stop, then you can do two things: run 10 minutes and then stop your workout. Or run 7-8 minutes, take a 2 minute walk break and run another 7-8 minutes. The last method makes you do more exercise and gets you into shape faster than the first. As a last suggestion, consider picking a goal race. A local 5k or 10k to compete in. It will help target your efforts and keep you motivated along the way. Best of luck and enjoy your running.